After the easy pleasures of Bobo-Dioulasso and nearly three weeks in what was becoming known as Bergina Faso (nice one Paul), it was time to move on. 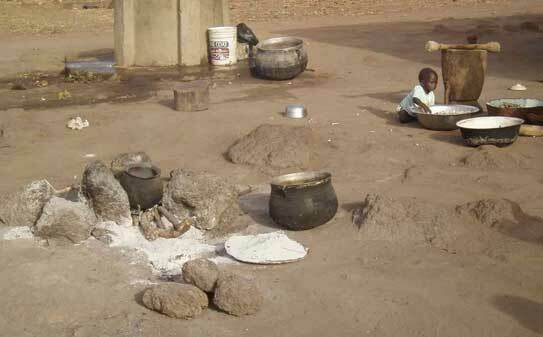 East from the capital Ouagadougou the land was increasingly dry and poor. And riding through the heat – up to 43 degrees now – was very uncomfortable, like sticking my head in a fan oven. From the road could be seen the habitations of the Somba, an isolated people who resisted Islam as well as the French, their huts clustered in fortified family sized groups, a few hundred metres apart. This is said to be the length of a spear throw, though I think todays Olympic javelin throwers would be surprised to hear that (the record is under a 100m). The distance is more probably reckoned to be gauged on the distance an old blunderbuss shotgun could fire. I had been considering various alternative routes to cross Nigeria, with its reputation for trouble – originally planning to continue east across the Sahel through the country of Niger, dropping down to Kano in northern Nigeria before entering the north of Cameroon. Being a solo traveller and reckoning I would be an easy target for hassle, my intention was to spend as little time in the country as possible, while avoiding the more heavily populated south. Three factors changed my mind. 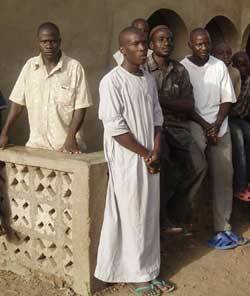 There had been reports of armed banditry on main roads around the Nigerian city of Maiduguri on the route near the northern Cameroon border; going via Niger was adding on a big distance; and more significantly I learned the notoriously difficult Angolan visa could be obtained in the capital Abuja, central Nigeria. As well as that I didn’t have a Cameroon visa which I would have to get down in Calabar, in the south east. So it was going to be a transit through the Benin Republic and across to Abuja. The last night in Burkina, I stayed in a lodge in Pama near the Benin border, a place straight from colonial days, with black and white photos of the former (Italian) proprietors, Bonazza – identical to John Wayne and Betty Grable - standing proudly over their lion kills. This area is apparently still popular for game hunting. That evening four French rolled into the lodge on the back of the lodge pickup after a day in the bush, their prize two antelope. They were catered for, sat drinking into the evening (keeping to themselves), and were off again early the next morning. As I was, crossing into Benin early. I had heard a visa could be purchased on the border, which was painless enough, though before I set off I was subjected to the personal attentions of one of the customs men. This was not unusual, the bike being the main attraction. It was seen as a very macho symbol by some (motorbikes I had seen on the journey were never larger than 125cc). Various characteristics would be attributed to me, usually concerning either my strength, virility or pulling power. Any female overland biker must cause quite some confusion! The smartly named Denis Alapini (pictured right) not only took a covetous shine to the bike, eventually getting around to the usual “Will you sell it to me?”, but wanted it so badly he insisted I phone him from South Africa and he would fly out to buy it off me. He was absolutely serious. The republic of Benin, or the ‘benign’ republic as I liked to imagine, (until the Burkinabé, with wide eyes, warned me of the continuing practice of voodoo in that country and to beware, as they like the flesh of a white man!) seemed that little bit more comfortably off. Plots of land were tilled tidily, the animals looked healthy, and the earth less dry than neighboring Burkina. 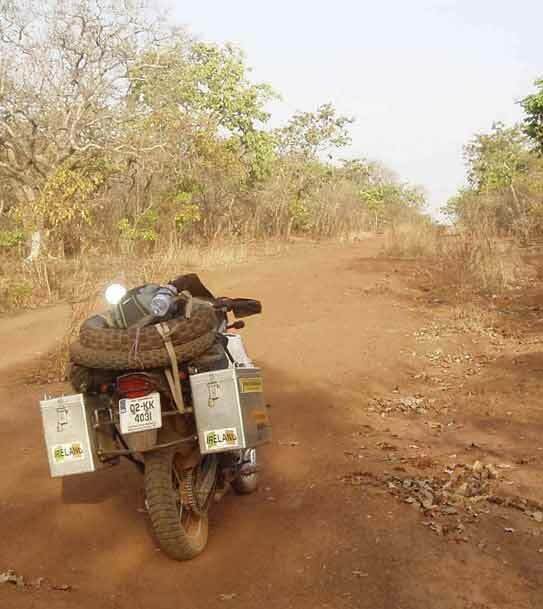 Crossing the red dirt roads of Benin towards the Nigerian border in a day brought me through villages where it seemed they hadn’t seen anything like me before, judging by reactions of jaw dropping and astonishment as I passed. This really was very traditional, some women walking by the roadside bare breasted. At the crossroads village of N’Dali where I stopped for a break, I attracted a crowd of about sixty people – just to look at the KilkennyToCapeTown roadshow! I also had the tastiest spiced meat brochettes so far on the journey, the meat that tender it couldn’t have been beef – though the vendor claimed it was. The audience were delighted, pointing and screaming with surprised laughter at my enjoyment of the food. I don’t know what they imagine the white man usually eats (or maybe they knew something I didn’t!). I spent the night in lovely Nikki (the town), with a relaxed atmosphere, where I met with a few ‘blancs’ working in the area. Matheus, a German dentist in his late twenties was there as a volunteer for three weeks. He told me the two dentists in Parakou, fifty kms away, were the only ones in the region and as there were no facilities for performing fillings, all he spent his time doing was extractions. Some of his stories about difficult operations in very basic conditions, unable to get an obstinate molar out, were painful to hear. Sara, also German, was a Ph.D student researching how aid in education was being spent. A signifant percentage of the rural population were ‘Peulh’, a people closely related to the Fulani, spread across the Sahel from the north of Cameroon west. 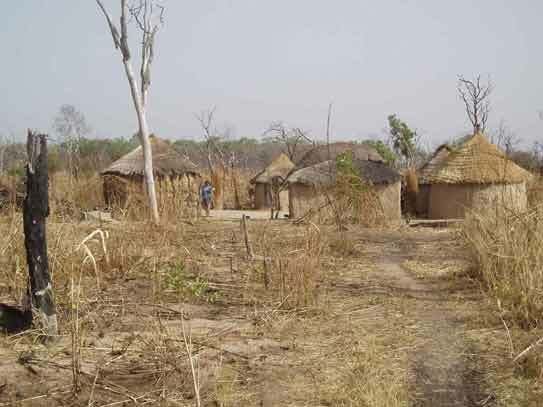 Generally nomadic herders, they have a practice of burning off forests to access more grazing, though its maintained increasingly that this is doing untold ecological damage particularly to the Nigeria savannah and rainforest. In Mali I was told the women are especially desired and perceived as beautiful because of their finer facial features and straight hair. Here the Peulh tended to have a poor record of sending their children to school. This Sara was told was because they were “stupid and ignorant”. She believed it was because they didn’t see any benefit to their children, there being no further study or work opportunities anyway. Also in the company were Martin and Maria, a Dutch couple in their mid thirties with their child, both doctors, who were employed by the local hospital the past eighteen months on a local wage. They get many patients coming across the border from Nigeria, as “the health set up is a mess over there. Even nurses from there are badly trained, basic hygiene practices they don’t understand!” I made a mental note not to get sick in Nigeria. Here, all patients, said Martin, would have visited a traditional doctor first before attending the hospital. Though coming across to me as a little self important (well I suppose he was important) and totally dismissive of any traditional remedies, I couldn’t help but admire the commitment of both of them. I asked what he understood of the practice of voodoo, or gris-gris as its sometimes known. Unsurprisingly Martin didn’t have much knowledge, but pointed out it was a lot more prevalent on the coast of Benin. This was where slaves were transported to Haiti, and there is a continuing tradition there of voodoo (‘zombies’ being one manifestation of the practice). I had arranged earlier to meet up with a Nigerian living in Nikki to get some information on road conditions. After a tasty meal of maize pate, more the consistency of wallpaper paste, “veg balls” and a spicy fish casserole for 40c, I unfortunately didn’t learn much about my route to Abuja, but did, along with twenty other Beninois crammed onto wooden benches in a small hut, see second from the bottom Southend wallop QPR 5-0 in an entertaining game. Sometimes these little distractions that took me back to a former life were great fun. The next destination was going to be, if nothing else, ‘interesting’. The world’s fourth biggest democracy and sixth largest crude oil producer, Nigeria would seem to have a lot going for it. However it has maintained a reputation over the years as being the continent’s most chaotic and dangerous country. According to one respected guidebook, “It is simply one of the world’s most difficult places to travel in.” (Bradt). If it were possible I would have avoided the country, but it wasn’t. 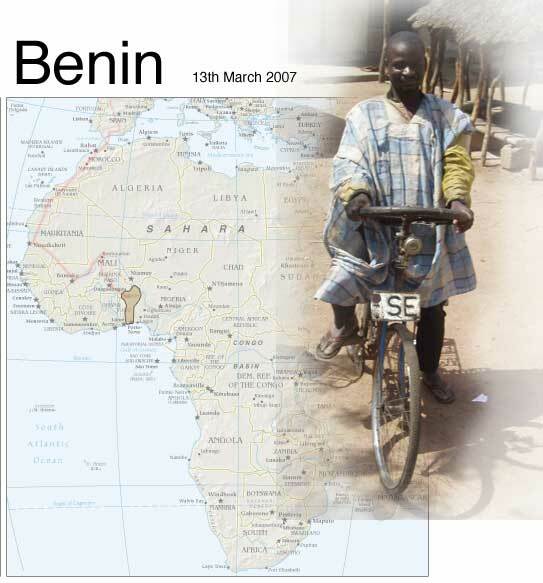 Some travelers I’d heard had shipped their vehicles from neighboring Benin to Gabon, avoiding both Nigeria and Cameroon. I intended to traverse the country, but in as short a time as possible. Before leaving Nikki I had to do a little maintenance on the bike, and before I set off at ten, I had already showered three times it was that warm. And off I set for Nigeria. On Martin’s recommendation, I had made an arrangement (€8) with Fathou, a nurse looking after the Health Centre at the tiny border town of Tchkandou on the Benin side, to accompany me and smooth the way with the Nigerian authorities who potentially could be an obstacle. This post saw very little traffic, certainly of the two wheeled kind from Europe. After the forty km ride on a fairly slow dirt road, Fathou (pictured below) thought he’d have a beer on arrival before the negotiations ahead. Fair enough (I didn’t join him, 11am a bit early for me with a days ride ahead.) After taking our time there, we completed the formalities with the Benin police. A potential hitch was the fact there was no Benin visa in my passport! Entering the country the previous day, the official had merely stamped me in and pocketed the 5,000 CFA, around €8. Managing to explain my way out of it and get stamped out, I crossed a small stream where the road petered out and up the other side to another shack. It dawned on me this was Nigeria. 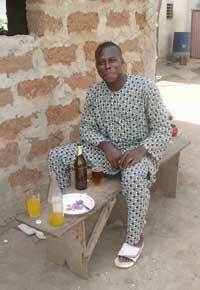 Hold on, where was the Benin customs? I had to get my carnet stamped out of the country. It transpired the customs post was no longer manned, and I should have had it done back in Nikki! I briefly considering ignoring procedures and continuing without being stamped out, but was advised by the Benin border guard it would only cause me grief down the road in Nigeria. Appreciating he was right, I resigned myself to the journey back to Nikki, where after the customs officer eventually returned from his lunch the necessaries were done, I returned to the border and presented myself, now soaked in sweat and hungry, to the bemused Nigerian border guard. He welcomed me warmly in English, refreshingly now the lingua franca. A poster in English was tacked onto the timber wall titled “Key Duties”, and listed People trafficking, Terrorists, Child labour, Child trafficking, International prostitution. There was a definite air of neglect and impoverishment around this border post. After the police forms had been filled, it was into another rickety shack for Mr Immigration. Uncommunicative and surly, he demanded various health and bike documents, scrutinising them carefully before stamping me in. Then relaxing, he smilingly asked if I “had anything for him” holding on to my documents. Anticipating such contingencies I had kept an old Time magazine which I fobbed him off with. Next it was on to the Customs, where the officer apologetically explained, “I left my glasses in the car that drove me here last week and I can’t read without them”. A good hour later, his nose to the page transcribing in longhand everything on the carnet – I had to read some of it to him – we were finished. I was drenched in sweat in the extreme heat of the afternoon. All this time a very large gentleman in a floral shirt, obviously the superior, was lounging in the shade with his feet up, radio by his side. I guessed he couldn’t assist his optically challenged officer as there was obviously some important protocol that prevented him doing that. Getting my stuff together to leave, he decided to introduce himself. “Mr Azodo, Head of Customs”, and proceeded to quiz me on my trip. Of course I felt I had to be polite, though he did seem genuinely interested in what I was doing. 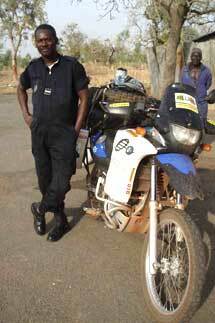 Eventually I got away setting off on a partly graded road to Kosi Busa, turning off for Kaiama in the direction of Abuja, my destination. This road was, “A bit rough, but motorable”, as advised by the border guard in a vague manner. Motorable. He quite obviously hadn’t been on it for years. This term was to return to me regularly the rest of the day (along with the enigmatic reflection from Mr Azodo, uttered in a deep voiced ‘home counties’ accent, “Across Nigeria to Calabar? Mmm, you have a very interesting journey ahead of you.”). It was mid afternoon before I began to appreciate my predicament. The ‘road’ on my map was little more than a dry(ish) river bed, and there was sixty miles of this before the next town. Normally quite vigilant, I was low on water and the heat was energy sapping. 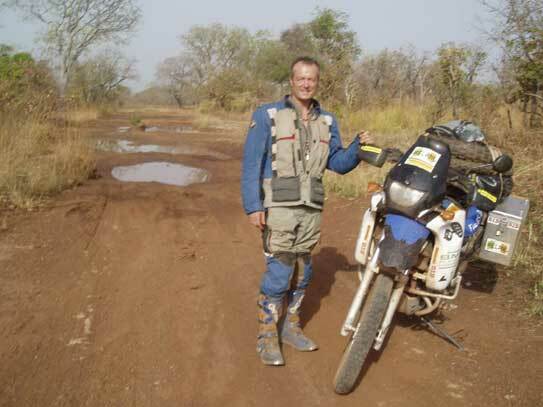 It was a fairly remote and lightly populated area – in the first hour I didn’t pass any sign of life – and if I came off, I was on my own in picking up the bike. This was quite a likelihood as the track was in terrible shape. The rains had scoured it in places down to bedrock, deep sandy ruts and large muddy potholes. As the daylight faded and I was making very slow progress in first and second gear, I began to weigh up my options for sleeping. The track skirted a wildlife reserve where there were lions, hippos and elephants and the idea of pitching my tent in the bush didn’t appeal. Warnings of “never travel at night, the bandits will get you” were feeding my increasingly nervous imagination. Coming across a small settlement with relief, I was greeted with excited curiosity by this small village of devout Muslims. They had seen few enough white people, let alone any overland bikers in these parts. A good hour was spent fielding questions (mainly from Karim Abdullah who spoke English well) such as what I thought of black people, could I eat their food, what did I do about mosquitoes, and of course the usual “how much is the bike worth?” When I indicated a man walking by with a gun over his shoulder, and asked what was it for, the reply was one of surprise. “For protection of course.” And not just from animals apparently, but humans too! The women were kept out of sight the whole time, apart from Abdullah’s mother who was introduced to me, embarrassingly kneeling in front of me. Any adolescent would bow on entering the adult’s company. It was a privilege staying with these poor farmers, sleeping on the floor in a mud hut, my dinner cooked for me in the outdoor ‘kitchen’ over a fire – rice with a fiery hot fish sauce – drinking water from their well. After the afternoon’s growing unease, I now allowed myself the indulgence of relaxing a bit, realising again that often the occasions of greatest anxiety and uncertainty provide the most unexpected pleasures and deepest satisfactions. The next day, after a few more tortuously slow, but now really enjoyable hours negotiating the rough track, I arrived at tarmac. 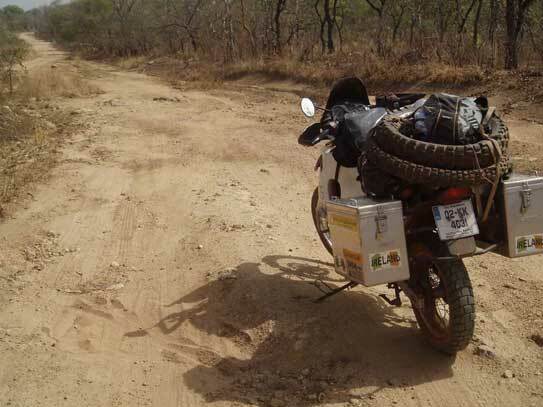 I had left the Conti Escape tyres on, mainly because the previous afternoon I didn’t want to spend time changing to the TKC’s, and partly to test them in sandy conditions to help decide what I wanted sent to Namibia for the gravel roads there. The Escapes were great on the really unstable surfaces and were now officially my favourite all round tyre! As for the bike – it had performed magnificently under duress. I had been waiting until Cameroon to change the chain front sprocket to the the 15 tooth option, which allows greater control at slower speeds on rough terrain, and still had on the 16 tooth. This put more strain on the clutch and the engine had to work harder. It didn’t let me down. In retrospect it had been a very satisfying experience, one I felt that would stand me in good stead further down the road.